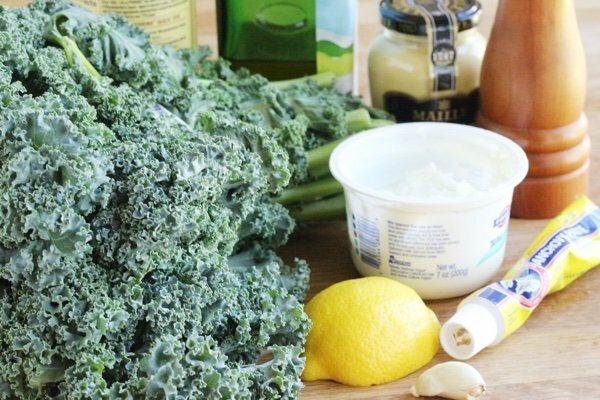 Raw kale Caesar salad will change your mind about romaine lettuce being the king of Caesars. Wasn’t Caesar a kind of king? I can tell you that making my own lighter version of Caesar dressing has made me want to pour it on everything including my toast. This dressing does not include egg yolks, mayo, or a ton of oil but what it does have is that wonderful salty, creamy flavor and texture of Caesar. The ingredients include anchovy paste which you can find above the canned tuna. The only big difference between romaine and raw kale is that you must massage the kale before you pour the dressing on it. If you massaged the romaine, you will have a liquidy mess on your hands. I wash the kale, tear it off the stem into good size pieces, pour over a tablespoon of olive oil and massage for about 2 minutes until it gets softer and more pliable. Taste it a couple of time until you approve of its texture. I created a video if you want to watch a master at work: Massage Kale. The “massage” step cannot be skipped because it changes raw fibrous kale into something chewy and quite palatable. I actually prefer it to lettuce. Also, kale can be stored in the refrigerator already dressed and it won’t melt (don’t try that with lettuce). The best part? 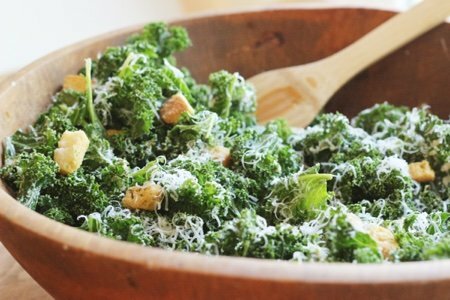 One cup of kale contains 5 grams of fiber, and 15% of the daily requirement of calcium and vitamin B6 (pyridoxine), 40% of magnesium, 180% of vitamin A, 200% of vitamin C, and 1,020% of vitamin K.
You can eat a raw kale Caesar salad, enjoy it, and do your body good. My kids will even eat this if I don’t mention the health benefits. My daughter kept sticking her hand in the bowl when she thought I wasn’t looking. Can you believe I have a child who steals kale? What will happen if I put out beets? 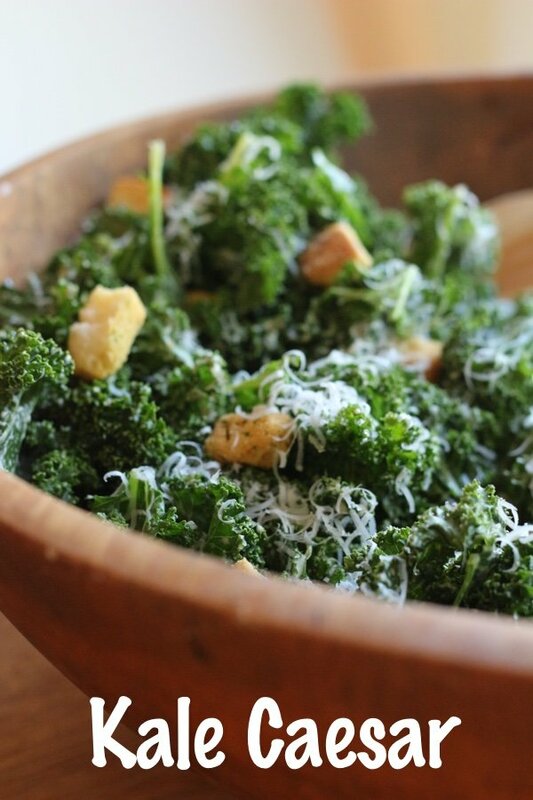 Place kale in large bowl and pour over 1 tablespoon of olive oil. Massage into kale for 2 minutes to soften it. Whisk yogurt, lemon juice, garlic, 1 tablespoon olive oil, Worcestershire sauce, anchovy paste, mustard, and black pepper in a medium bowl. 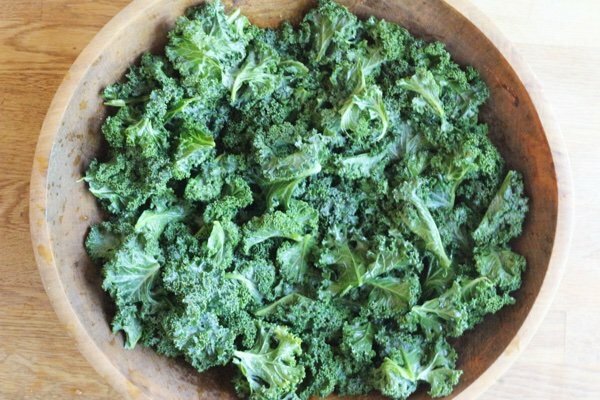 Pour over kale and toss until all the leaves are coated. Serve immediately or store for later consumption. It will last about three days in a tightly covered container in the refridgerator. Hmmm - I'm one of those kale haters (bleagh) but this does SOUND interesting. I love Caesar salad so I think I'll give it a try. I like the idea of baby anything so maybe I'll go along with Shelly's thinking. Up until now I've always thought of kale as something I'd eat if it was the last food on earth and just maybe it might save my life. If this salad works for me then I'll certainly let Lisa know...and maybe even recommend she be given a medal! I agree...I would also try this with Baby Kale, it is tender and not as tough as regular kale. It sounds yummy! @Shelly and @Gigi - I love baby kale, too! Because it is far less tough, you don't need to massage it. Thanks for your comments! can I eliminate the anchovy paste.... thanks.